For Combination / Oily Skin. 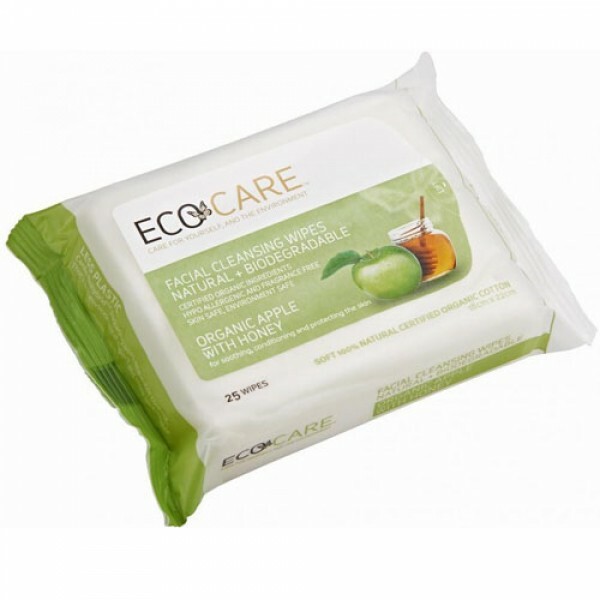 Hypo-allergenic organic cotton cleansing wipes with organic apple and honey for cleansing, refreshing and conditioning the skin. Most suitable for combination or oily skin types, these wipes may also be useful when travelling to hot humid climates where perspiration can leave skin feeling oiler than usual. Organic Apples help to naturally cleanse the skin of oily build up leaving your skin feeling form and refreshed. Organic Honey is nature's little treat adding moisture and natural antioxidants to assist the skin with hydration and rejuvenation. Aqua (Water), Cotton¹, Polyglyceryl-4 Caprate, Pyrus Malus (Apple) Juice¹, Benzyl Alcohol², Betaine³, Camellia Simensis (Green Tea) Leaf Extract¹, Potassium Sorbate, Concentrated Aloe Barbadensis (Aloe Vera) Leaf Juice Powder¹, Dehydracetic Acid, Benzoic Acid², Sorbic Acid², Mel¹ (Honey), Citric Acid², Ascorbic Acid², Sodium Citrate. ¹Certified Organic Ingredient. ²Nature Equivalent. ³Derived from renewable vegetable sources. Not tested on animals.Store in a cool dry place, out of direct sunlight.